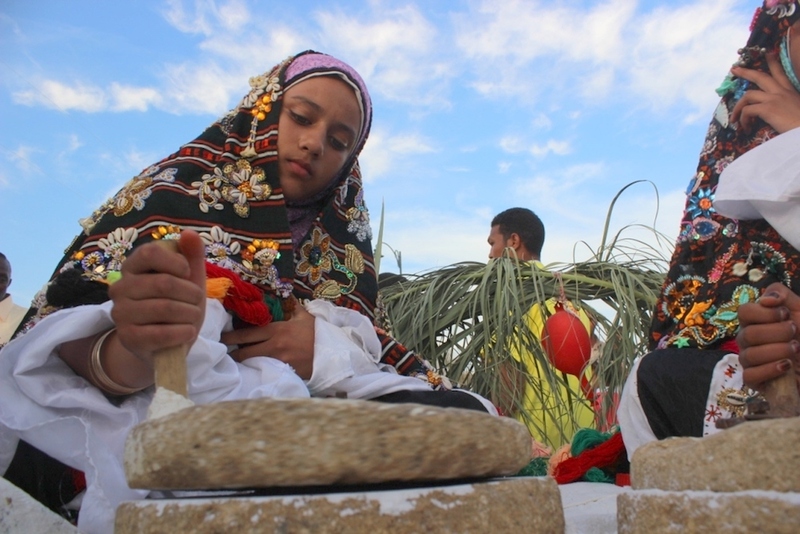 Girl grinding salt while wearing the traditional dress of Siwa Oasis, in Egypt’s Western Desert. Courtesy of Ahmed Hamed Ahmed/Wikimedia Commons. It wasn’t the Axis’s invasion of their ancestral homeland that concerned these Bedouins, however, but rather their mistreatment by their own government. With the outbreak of the war, they had been thrown into a prison reserved for foreign subjects, and their families were suffering gravely in their absence. Accordingly, they demanded an explanation for why they were being punished as if they were strangers in their own native land. Why did the Egyptian government view its own desert-dwelling Bedouin population with such suspicion and contempt? After all, shouldn’t the native inhabitants of Egypt’s desert domains, which comprise roughly 90 percent of the country’s land surface, have counted as being just as Egyptian as inhabitants of Cairo or the Nile Valley? The answer to these questions lies in the complex history of Egypt’s formation as a modern territorial nation-state. Nations must never be taken for granted. They do not exist from time immemorial as naturally bounded and cohesive social units, but rather are actively made (and often re-made) to serve particular political projects in particular places at particular times. Even Egypt—ostensibly one of the most ancient political civilizations on the planet—underwent dramatic transformations in the late 19th and 20th centuries before it emerged as a modern nation-state like the one we know today. One such transformation involved the projection of a unified territorial identity from the center of power (Cairo) into the furthest reaches of the state’s sovereign domains, including the Western Desert. While other nation-states underwent similar transformations, the Egyptian case contained some particular elements that would turn out to be consequential for the country’s region and its history. My own interest in the territorial dimension of Egyptian nationhood began nearly a decade ago, on a 10-hour bus journey across Egypt’s Western Desert to the remote oasis of Siwa. As I stared out my window at the endless barren expanses, I began to wonder how all of this beautiful wasteland became part of Egypt in the first place. My sense of bewilderment only grew when I arrived in Siwa, which lies only 30 miles from the Libyan border and has an ethnically distinct population that more resembles that of some Libyan regions. (Siwans are of Berber descent and did not speak Arabic for much of their history.) The Egyptian history I had studied as a graduate student, focused as it was on Cairo and the Nile, had little to say about the incorporation or political status of such far-flung places. So I set out to craft a comprehensive modern history of the vast region I came to call “the Egyptian West.” My foray into the archival sources yielded many surprises. For starters, I learned that Egypt’s western border had gone undefined for most of the country’s history, and that the first modern political map attempting to delineate such a border—an Ottoman map from 1841—went missing for the better part of a century. Although various statesmen periodically noted its absence—Lord Cromer, the British consul-general of Egypt from 1882 to 1907, surmised that the map was “supposed to have been lost in a fire which destroyed a great part of the Egyptian archives”—no one seemed especially vexed by this. In fact, Egypt’s marginal borderlands were typically ignored in the cartography of the period. When they were represented at all, they were left intentionally fuzzy. The powers in the region—Britain and the Ottoman Empire (still technically sovereign over Egypt)—actually conspired not to define the border, lest it provoke unnecessary legal or diplomatic controversy. This stance became particularly thorny during the first decade of the 20th century, when the Italian government—seeking to lay the groundwork for its colonial occupation of Libya, which would begin in 1911—repeatedly pressured the British to draw a western border. As I stared out my window at the endless barren expanses, I began to wonder how all of this beautiful wasteland became part of Egypt in the first place. Nations are not made merely by drawing borders around sovereign territory, however; they must also to some degree incorporate and assimilate their heterogeneous populations into a unified political community. In Egypt, this process began in the last quarter of the 19th century, but it had mixed results. Law was one institution that the government attempted to use as an instrument of assimilation. Beginning in the 1870s, the government passed a series of reforms that aimed to streamline jurisdiction and legal practice across the country, including the deserts and western oases. But it was not long before the government reneged on this project and ceded judicial autonomy to the inhabitants of the country’s vast borderlands. In the case of the town of Siwa, one official tried to explain the government’s striking about-face by citing the remoteness of the oasis as well as the fundamental distinctiveness of its people. “The town is far from Egypt by a distance of approximately twenty days traveling by camel,” he argued. “It falls in the middle of the desert, and its people have different customs and (linguistic) conventions, and tastes that diverge completely from those of the Egyptians, by virtue of the fact that they are pure [Bedouin] Arabs.” Here is one clear case of the modernizing Egyptian state succumbing to the extreme challenges of standardizing its institutions across the full expanse of its sovereign territory; Siwa was simply too far and too different to be folded into the Egyptian national judiciary at this time. When it came to actually enforcing the new laws, however, the government—again hard-pressed to exert its sovereign control in the sparsely inhabited deserts—was forced to cede considerable power to the local tribal leaders themselves. Despite the veneer of formality added by the legislation, Egypt’s Bedouins were still being treated as a people apart. So it probably shouldn’t have come as such a surprise when the Western Desert Bedouins found themselves in jail at the start of World War II, and being treated by their government like a dangerous fifth column. The Egyptian government’s internment of its people is best interpreted as a reflection of its own lack of faith in the mechanisms through which its territorial sovereignty had been asserted in the country’s western borderland. Egypt might have clarified the limits of its territorial statehood with the 1925 border treaty with Libya, but it had by no means woven an enduring social fabric for the collective nation within those boundaries. The Egyptian state’s antagonistic relationship with its own Bedouin population continues to this day. This is clear in the Western Desert, which has emerged as a haven for militant groups reportedly linked to the Islamic State. The Egyptian government’s heavy-handed response has led to some grave mistakes, none more egregious than the security forces’ aerial assault on what turned out to be a caravan of Mexican tourists on a Bedouin-led desert safari, killing 12 and wounding numerous others. The now years-long Egyptian military campaign in the Sinai Peninsula, nominally waged to root out the Islamic State as well as Al-Qaeda, is another sign of enduring conflict in the borderlands. In these present-day events are echoes of the particular history of the country’s emergence as a modern territorial nation-state. Moments of significant political upheaval, from World War II to the complicated fallout of the Arab Spring uprising of 2011, have always seemed to foster contests over territorial sovereignty in the country’s borderlands. And what we see today is not so different from what the Egyptian government was struggling with over a century ago, when it first sought to consolidate the nation at the margins of its sovereignty. As a result, what it means to be Egyptian in the country’s desert borderlands remains an open question. Matthew H. Ellis is an associate professor of history at Sarah Lawrence College, where he holds the Christian A. Johnson Endeavor Foundation Chair in Middle Eastern Studies and International Affairs. His first book is Desert Borderland: The Making of Modern Egypt and Libya.